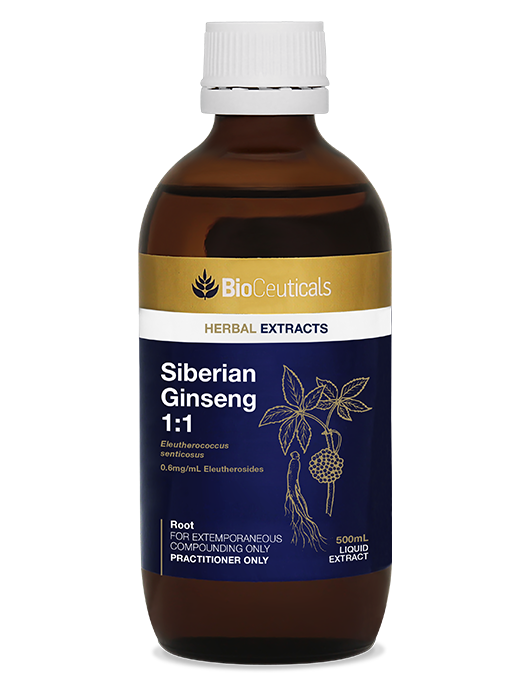 Siberian ginseng is a hardy shrub that grows up to two metres in height. Naturalised in the northern regions of China, Japan and Korea, and in the far Eastern zones of the Russian taiga, it has been used as a medicine in all of these areas. Its botanical name, ‘Eleutherococcus senticosus’ is derived from the Greek words ‘eleutheroó’ meaning ‘free’ and ‘kokkos’ meaning ‘seed’, and the Latin word ‘sentis’ meaning ‘briar/prickly bush’. According to Chinese medical records, where it is referred to as ci wu jia, Siberian ginseng has been used medicinally for over 2,000 years. In more modern times, the herb has had a positive reputation with Russian cosmonauts. Solvents: 57% organic cane ethanol, 28% mountain spring water, 7% glycerin, 8% organic honey. Recommended dose: 10-20mL per week. 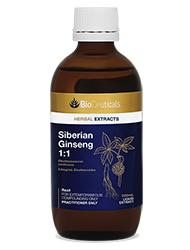 For further education and research, refer to the BioCeuticals Siberian Ginseng Monograph.